The Toronto Transit Commission (TTC) recently announced that cash fares for a subway or bus trip are rising in 2016 by a quarter to $3.25 (token fares are rising by a dime to $2.90). Certainly, Toronto residents have some reason to complain; Toronto’s transit costs are among the highest in North America, on par with the pricey transit systems in cities like Ottawa, Calgary and Miami. One of the driving factors for Toronto’s sky-high prices is that the city provides the lowest per-passenger subsidy on the continent (just $0.88), meaning that riders must pick up more of the tab for each of their trips. However, it is short-sighted to focus on incremental fare increases when every transit system in the world is raising prices to manage their increasing costs. Consider that there will have been five fare hikes on the TTC since the year 2000, with cash fares rising 62.5% over that period (from $2 to $3.25). But that is actually on par or even lower than cash fare increases for comparable cities in Canada or around the world. Subway systems in Montreal (62.5%) and Vancouver (57%) experienced nearly identical fare increases over the past 15 years, while passengers in New York City (83.3%) and London (123%) have been forced to shell out much more in the past decade and a half just to get around town. 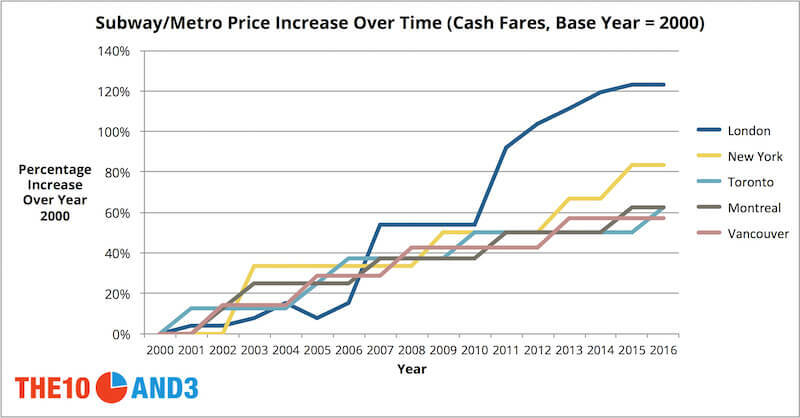 Metro fares continue to steadily march upwards around the world, from Boston to Rio de Janeiro to Berlin, due to an increasingly expensive mix of energy, infrastructure and labour. In protesting the upcoming fare increase, Toronto City Councillor Glenn de Baeremaeker suggested that “every year we go back to our customers and add a nickel or add a dime. That is the death of a thousand cuts; eventually people will say [they’re] just going to go out and buy a car.” The councillor is barking up the wrong tree. Fares that rise in order to keep up with increasing operational costs are necessary to keep the system running and pay the bills, and Toronto has managed to keep this kind of fare growth quite modest relative to comparable cities in Canada and around the world. To keep transit affordable, tackle the elephant in the room — subsidies — and don’t be distracted by the periodic fare hikes. For consistency, we looked at the cost of a single ride cash fare in each city. Many transit systems do offer various tokens, cards or passes that can give a discount below the cash fare. Vancouver: Translink. We used the travel cost of 1 zone. London: Londonist. We used the cash fare for a single Tube ride for zones 1-4. Don’t miss our newest stories! Follow The 10 and 3 on Facebook or Twitter (@the10and3) for the latest news and analysis.